Many people would call raking sand stupid, pointless, crazy, even. Most people think to live as a monk is crazy. To me there is an undeniable serenity in these gardens. A movement within stasis. An asymmetric balance. And their pointlessness seems to be the point. Of course, the gardens are simply beautiful. I agree, the simple repetition is the point. It is charming and meditative to perform the same action every day. I often wish we were much more limited, in fact I have wished to be thrown in jail, so I didn't have so many choices. Freedom is terrifying. It's only through limits that we find true freedom. Jack White of the White Stripes said this; Sartre said it too. It is very useful creatively to have restrictions, rules and limitations. There is something very empowering in having to overcome. And rules can be like train tracks which keep our minds and ideas (and metaphors) on course. Then again, if performing the same action every day is charming, why is working such a drag? 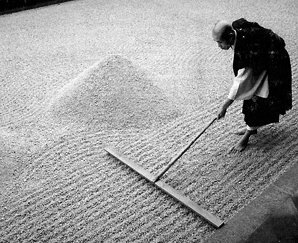 Believe it or not, in longer jobs, from time to time, I find myself drifting into a sort of zen-like state in which I am doing nothing but the work.